Each week we stay organized by picking a book and a theme and using it as our foundation for fun during the week! We follow along with the weekly virtual book club for kids schedule and have a blast! 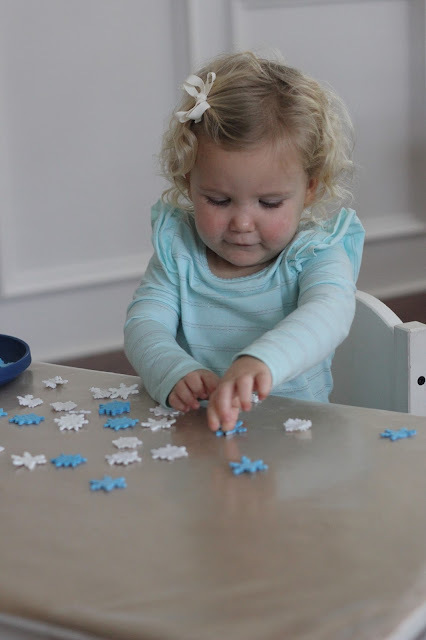 This week we are focusing on SNOW and exploring snowmen and snowflakes. 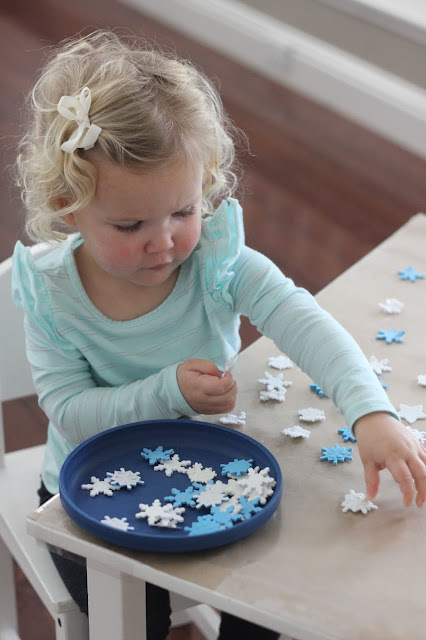 We have loved making spin art snowflakes and doing snowman themed tot school in the past, so we are excited for this week! 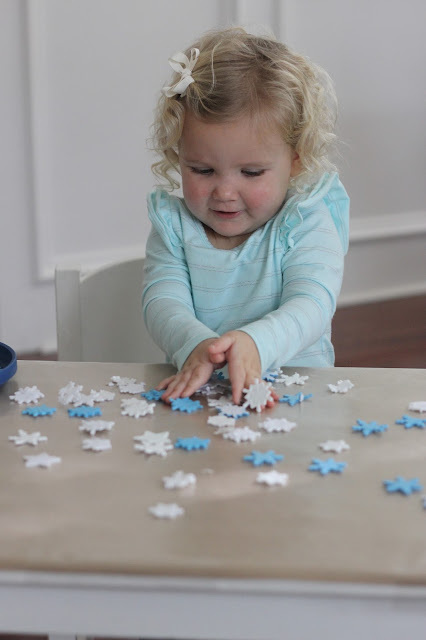 Today we are sharing how we made a super easy (but addicting) snow themed sticky table with just a few materials we had at our house. To get started, you need to measure your roll of paper and lay it out on a table. Then measure a piece of contact paper to go on top (sticky side up) that is the same size. Tape the paper roll onto the table (or wall) and then pull the contact paper off the backing and carefully stick it (sticky side facing out) to the paper using packing tape or another type of clear tape. Make sure the paper and sticky contact paper are securely stuck to the table (or wall). 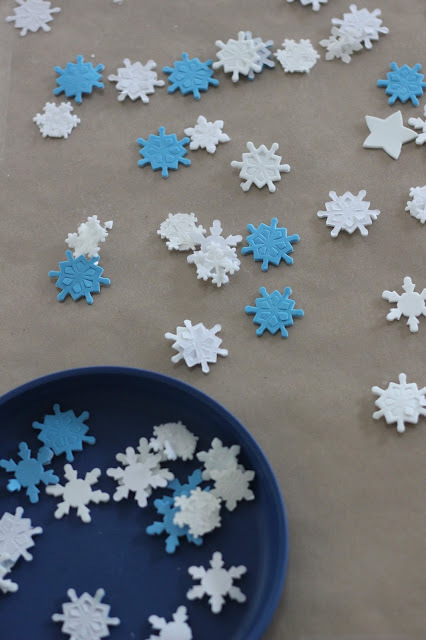 Next, put a bowl of snowflakes (paper, foam, etc.) 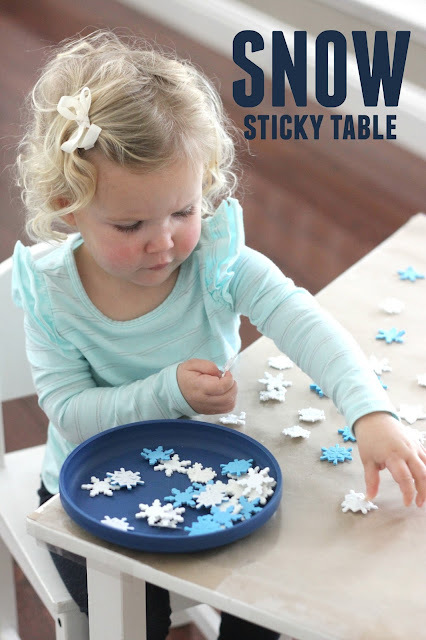 on the table and tell your little one to come over and explore the sticky table. 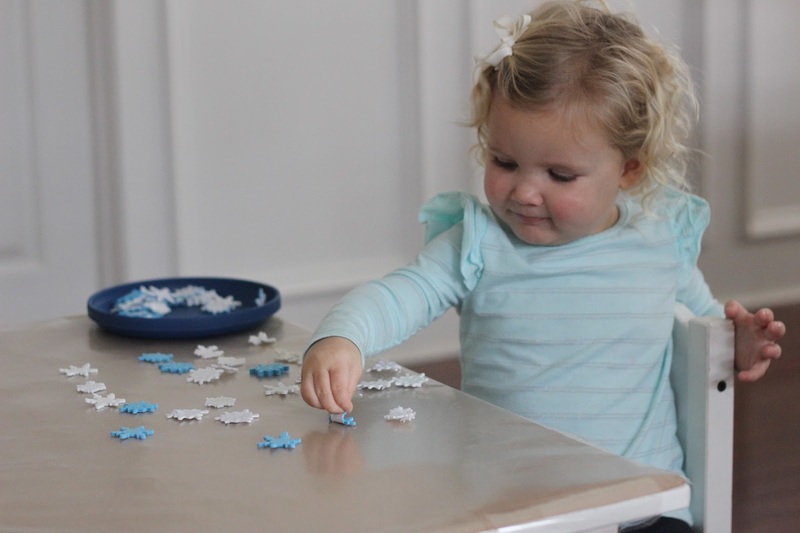 Typically I like to just lead the kids to the activities and not show them what to do with the materials... and then just watch and see how they manipulate them and explore them. 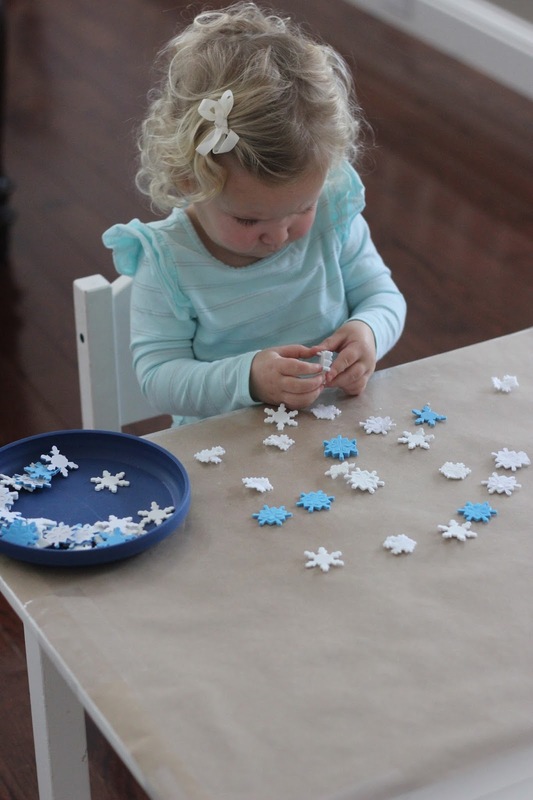 My daughter quickly discovered that the table was sticky and had fun dropping the snowflakes onto it, taking them off, and re-sticking them again. Foam stickers can move around easily. After awhile I think my daughter figured out how to pull some of the backings off the foam stickers and that was exciting to see! While we explored, we talked about colors and shapes and other observations that we made about the snowflakes. There were a few different types and each one was unique. This sticky table is an activity we've left out all week and the kids like to keep coming back to it, exploring it, and moving things around. As an adaptation, you could also add some foam snow balls and make foam snowmen to vary up the activity a bit. 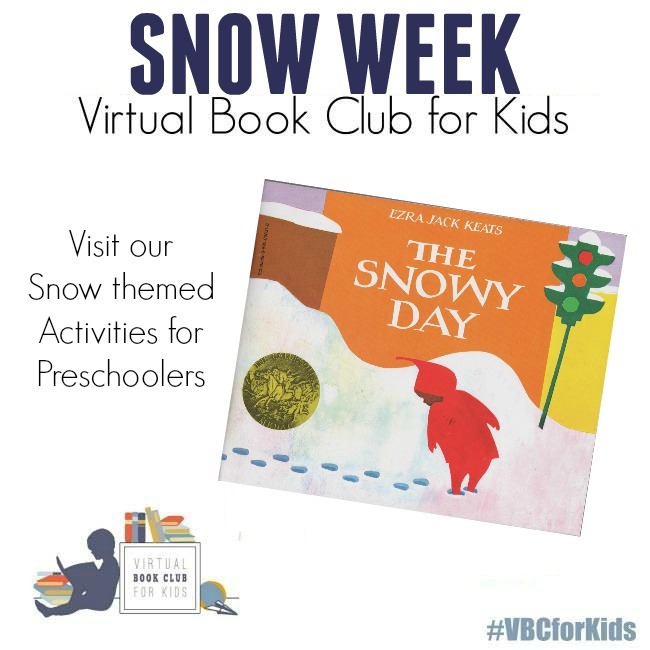 In addition to doing our snow sticky table activity, we are also reading (referral link) The Snowy Day by Ezra Jack Keats as part of our Weekly Virtual Book Club for Kids.